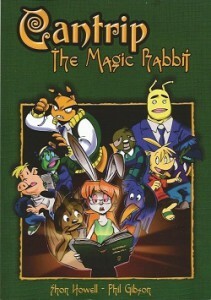 Cantrip The Magic Rabbit is an on-line “anthropomorphic comedy” black & white comic created by “the popular Furrlough duo of Shon Howell and Phil Gibson” (according to the publishers). Here’s the description: “Strange things are happening in Templarsville, Oklahoma. The students at Julius Schwartz Memorial High are abuzz about the new girl, Candice Tripp. They say there’s something unusual about her, possibly unnatural. Of course, the fact that she was discovered in an abandoned house outside of town with complete amnesia lends itself well to these types of fanciful imagination. With her new friends, Candice will learn what it’s like to live in a normal town, until her very un-normal past comes back to haunt her!” Now Radio Comix are releasing the collected Cantrip The Magic Rabbit as a softcover graphic novel next month. You can find out more about it at Second Ed.